Sunrise CSP provides a low cost, robust and high performance laminated solar mirror panel and an associated high-volume manufacturing process utilising state-of-the-art automated manufacturing processes. 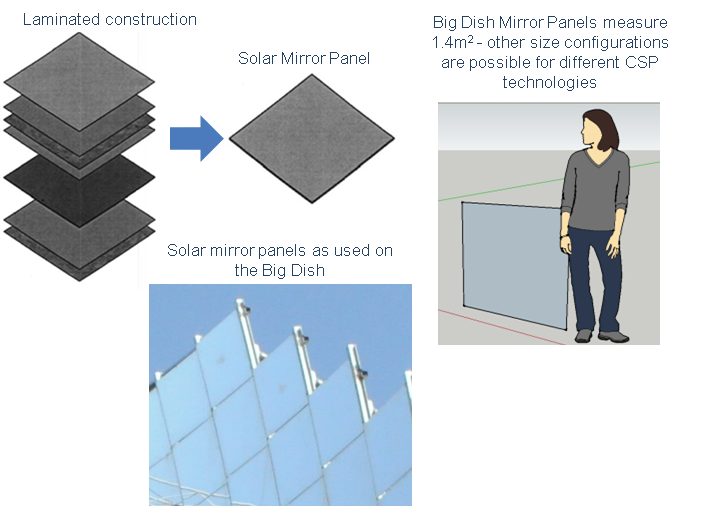 Each Big Dish requires 380 SMPs to make up its ~500 m2 reflective surface area. This means that a 100 MWe solar field will use about 356,000 mirror panels. The high throughput and efficient design delivers low-cost mirror panels and supports a rapid and cost efficient solar field deployment. Focal accuracy: Each panel is accurately formed with approximately 1 mrad slope error. Highly reflective: The panels utilise the world-leading, low iron, thin (~1mm) mirrored glass with ~95.5% reflectivity to deliver the maximum possible solar energy to the receiver. Quality control and product traceability: Every SMP is tested using automated laser measurement systems and every SMP is uniquely identified with a Datamatrix code providing a lifetime link between field performance and the materials and production parameters of each SMP. Uniform design: Designed for high volume automated production, every SMP is the same in size, shape, focal specification and material composition, delivering a low unit cost. Optimised for installation: SMPs are installed directly onto the dish structure with no focal adjustment required at installation or during operations and maintenance. Structural strength: SMPs are a structural element, not a dead weight, so that the mirror panel contributes to the dish support structure stiffness. Low O & M: SMPs are robust and durable with a target life of 30 years and are not damaged by events such as hail storms. A total CSP market solution: The focal length of SMPs is tuneable for a variety of CSP systems, e.g. trough concentrators and heliostats, opening up new revenue opportunities with SMP supply for projects using alternative CSP systems. Pilot plant ready to go: Sunrise CSP has designed a scalable facility initially configured for a capacity of 3,400 mirror panels per day equivalent to 4,600 m2 per day or ~5 MWth per day. This facility can be implemented in stages and then expanded as commercial opportunities drive increasing demand. Protected IP: Sunrise CSP holds patents or patent applications in target markets for its SMP.